A luxury villa in Mallorca with private swimming pool and tennis court. Can Totxa has been built to resemble a traditional Mallorcan finca, yet inside it is very modern and minimalist, constructed to the highest of standards. 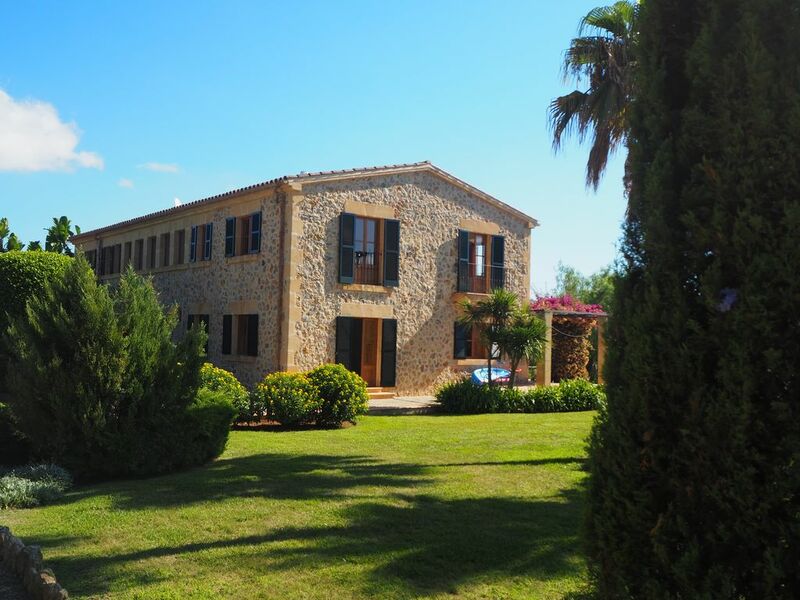 The house, built recently in classic Mallorcan farmhouse style- local stone with a traditional design. However, the modern, contemporary interior of the house is in complete contrast to the exterior. Clean, fresh lines and neutral decor create a cool and calm ambiance and the open plan design of the kitchen and living area creates a feeling of spaciousness. The house has soft limestone floors with under-floor heating. All the rooms are air conditioned and although only 4 bedrooms the house is a massive 4500ft2. The house sits within a country estate that goes by the same name and there are 4 other luxury villas within this area. The pool is at the front of the house and is overlooked by a covered terrace. I bought this house after many trips to Pollenca. As a great tennis fan added I the court in front of the house, I think it makes a great addition to an already great house. I hope you enjoy it as much as we do. Thank you for looking at our house in Mallorca We love the area, its great for all ages, the beach is close by and the town of Pollenca has a great buzz, especially around the main square where the kids can run around while the adults relax! The area is great for Tennis, cycling running and all types of activities in the sea. 3 x en-suite bathrooms (one is a large wet room). Separate bathroom downstairs. 50 feet long with dining area and 2 sofa areas. Kitchen has electric hob and cooker, dishwasher, microwave fridge/freezer drinks fridge and full crockery and cooking facilities. All weather tennis court at the villa. Golf courses 2km and 10km away. Notes on accommodation: Fully air conditioned with under floor heating and 2 open fire places for winter rentals. Although the house is suitable for children, small children should be supervise as there is a small drop from the ground floor terrace to the lawned area 4 feet below. Outside: All weather tennis court to the front of the house. Large terraced areas with seating and dining areas. 8 quality sun loungers and sun shade. Out door day bed on upstairs terrace. Swimming pool 16x4m large decked area. Gas barbeque. Utility Room: Washing machine and dryer food storage cupboards. Cleaning / Towels / Linen / Maid service: Maid service 6 days per week Linen and Towels changed twice weekly. Other: TV / Playroom with flat screen satellite TV and DVD. This is our fifth time staying here and we have already booked our 6th for next Summer. To find a villa this perfect for family or friends is rare. The pool is great for lengths, the tennis court is perfect for working up an appetite for dinner or just when you get bored of sunbathing and it also has the most peaceful setting with beautiful gardens despite being so close to Pollenca. The rooms are gorgeous and it’s a rare villa in having 2 almost identical master bedrooms so ideal for 2 families sharing. Stunning Finca in Pollenca with a pool, a tennis court and a fabulous chef! A very relaxing and enjoyable stay in a stunning & spacious Finca for 8 guests. The chef was incredible, spending hours on every meal, and producing food that any west end restaurant would be proud of. As a swimmer a proper lap pool is also a big plus, and we all had a very relaxing and enjoyable stay. We had a fantastic week at Can Totxa and were very reluctant to leave! The villa is stunning, set in beautiful gardens with an amazing swimming pool. Everything that we could have needed was pre-empted and provided for generously (even down to the ample supply of toiletries). Sergio is an amazing chef and every meal he cooked was delicious! He made us feel very welcome and looked after us in a relaxed and friendly way. He even arrived at 6.30am on our departure day with breakfast pastries and provided baguettes for the flight. That really was going above and beyond! Christina, your housekeeper, was also incredibly warm and friendly and a pleasure to have around. We are very much hoping to come back to Can Totxa, and would like to visit at other times of the year when the weather is better for being more active….cycling etc. I will definitely be recommending the villa to friends. Cycling in Mallorca, Bikes etc can be arranged for guests wishing to explore the mountains of Mallorca. Beach at Port de Pollensa only 10 minute drive away. Nearest airport Palma. House is 40 minute drive from airport. Car hire advisable. 1 mile to Pollensa Old Town for shopping bars and restaurants. Booking Notes: See website for booking details. Changeover Day: Saturday preferred. Notes on prices: Prices are for the property per week in pounds. Long winter let by separate negotiation.